You can manually enable or disable Comodo Secure DNS service in your Windows XP computer by modifying the DNS settings accessible through Control Panel > Network Connections. Select the 'Control Panel' from the Start Menu. Click 'Network Connections' from the Control Panel options. Right click on your connection from the Network Connections window and click 'Properties'. Select 'Internet Protocol (TCP/IP)' and click 'Properties'. Click the radio button Use the following DNS server addresses and type in Comodo Secure DNS addresses in the Preferred DNS server and Alternate DNS server fields. Please note down your current DNS settings before switching to Comodo Secure DNS, in case you want to return to your old settings for any reason. 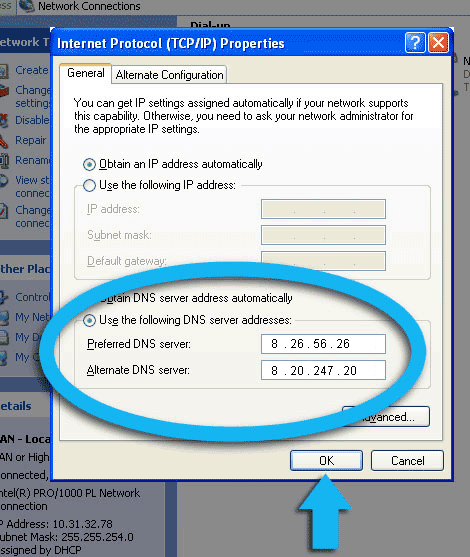 Selecting 'Obtain DNS server address automatically'. This means that you will use the DNS server provided by your ISP. This is the option that most home users should choose if they wish to disable the service.